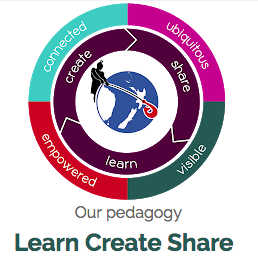 Manaiakalani ascribes to the learn create share pedagogy, where students are constantly engaging in a cycle of learning, using that understanding to create, and then sharing what they have learnt/developed/created. Also, students might skip ahead to create and learn while they do so! I personally like this pedagogy because it's a nice simple checkpoint for me during planning my lessons or a sequence of lessons; am I giving students time to process all the new scientific concepts they're being exposed to? What are they doing with it and how are they taking ownership of it? Thinking about learn create share means I can't just be transmitting knowledge and holding all the power; I need to pass it over and I need to do so regularly. Learn create share also nicely lines up with SOLO. Learning is unistructural and multistructural, maybe even sometimes relational depending on the learning process; creating often requires relating ideas and creating is definitely an extended abstract process as the learning takes on a new form. Anyway, I need to consider learn create share while I think about changing the junior curriculum. I think the answer to this lies in structuring the new junior curriculum around SOLO taxonomy, where learning outcomes are phrased as "I can" statements. That way, learners should be able to articulate where they are and where they're going next, and say things like "I need help so I can.."
Having a clear progression of SOLO levels and associated learning activities will provide ever-increasing cognitive challenge as students move through the SOLO levels of a new scientific concept. Being able to move up and down through the levels should provide both the scaffolding and challenge for learning; move down and be scaffolded if a particular SOLO level is too hard, or skip on and move up a SOLO level to provide challenge if you already "can do/describe" things. I think engaging learners will be the hardest thing. As with committing to any one framework or any one learning style, this can lead to the loss of novelty and excitement! I can try to plan varied activities and practicals as often as possible, cultural links and links to life, etc, but I think it will often be down to the teacher to spot if students are becoming disengaged and their class needs a bit of 'spicing up' or offline variation etc.